This is about as weird (and gross) as it gets... so odd, I wanted to verify it from two sources (and did). 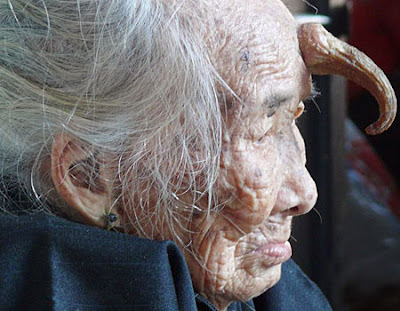 Xiou Ling, a woman from Zhangiang, China has developed a 4.7 inch (12cm) horn on her forehead. The horn first appeared in 2003 and has gotten progressively bigger. Doctors think it may have something to do with a hormone imbalance. The 95-year-old woman is saving money for treatment and removal. ewh....I pray she gets that money saved up.